Appalachia has lost one of its own. As you probably have heard, on June 23, the great and legendary Dr. Ralph Stanley passed away. Stanley epitomized and popularized mountain music. He's one of those who made us all just a little bit prouder of our mountain roots. 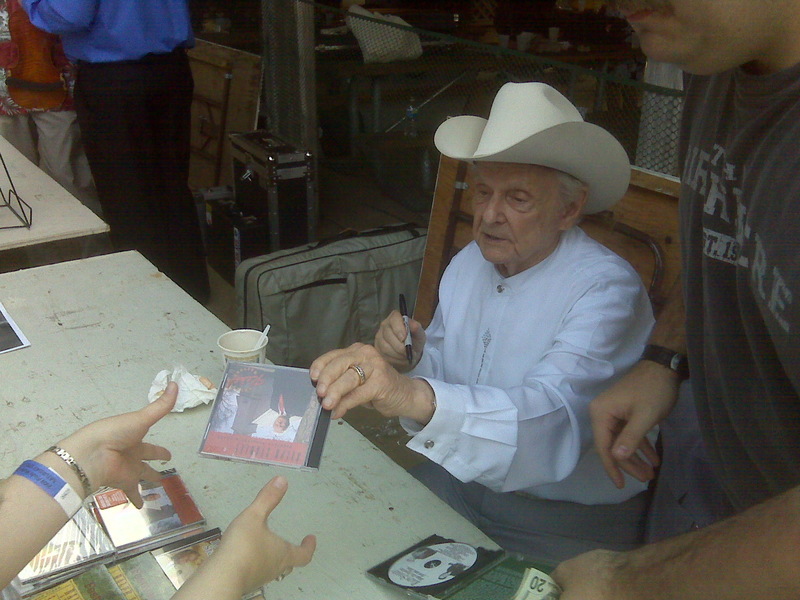 RIP, Ralph Stanley. You will be missed, but your music and what you've done for Appalachian culture will live on...and for that we thank you, kindly! Just a few days before Stanley passed, my nephew got married and we ironically "serenaded" him and his new bride with a surprise performance of "Man of Constant Sorrow"--a song made popular by Ralph and his brother Carter in the 1950's. My nephew is a huge "O Brother Where Art Thou" fan, so we had a lot of fun with that one. The wedding was such a beautiful ceremony and celebration! One of the neatest things about the day was how my nephew's Appalachian heritage was honored. Last summer I wrote a three part series about incorporating your Appalachian roots into your wedding day...but I must say that my nephew's wedding topped them all! From mountain music played and sung (including some old timey solos by my dad), to a groom's cake that was a homemade 14 layer Kentucky apple stack cake made by my nephew's granny (my mom)...the day was beautifully laced with mountain touches! 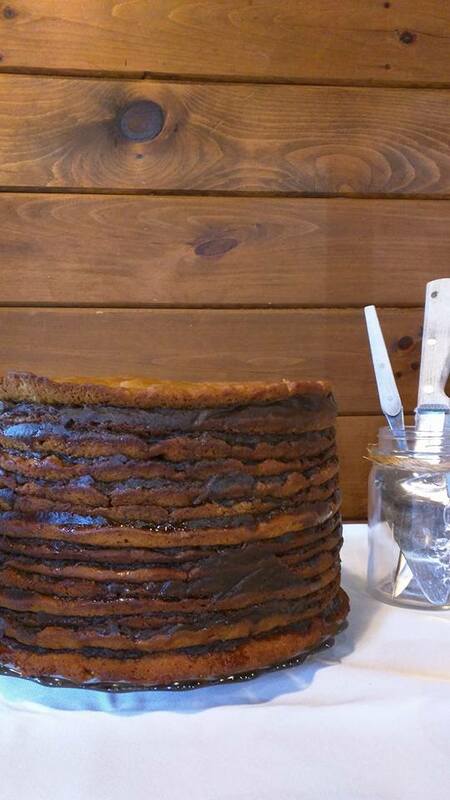 The 14 layer apple stack cake my mother made for my nephew's wedding! And yes, you read that right...14 layers! 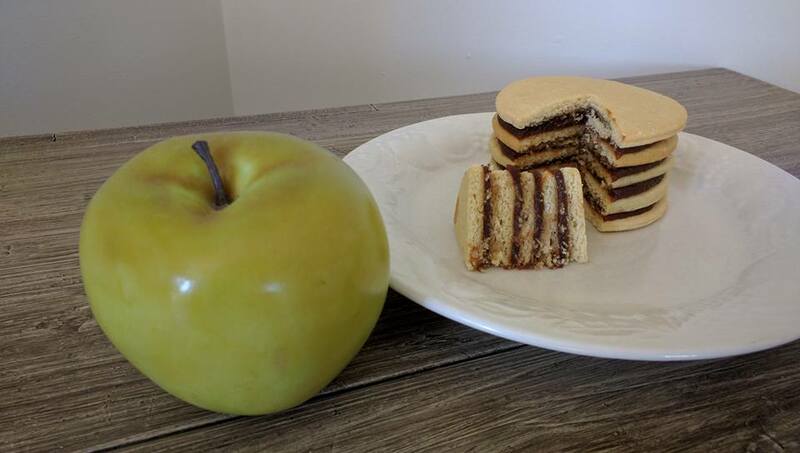 Legend has it that the apple stack cake was the traditional wedding cake in the southern mountains. Supposedly, when a couple married, close friends of the bride and groom would each bring a layer of the cake...and the bride's family would provide the apple filling. The bigger the cake, the more popular the bride. I must say, this 14 layer stack cake was the biggest apple stack cake I have ever laid eyes on in my life! I think my mom was so honored to be asked to make that cake, and ended up pouring her heart and soul into it! So truly special! 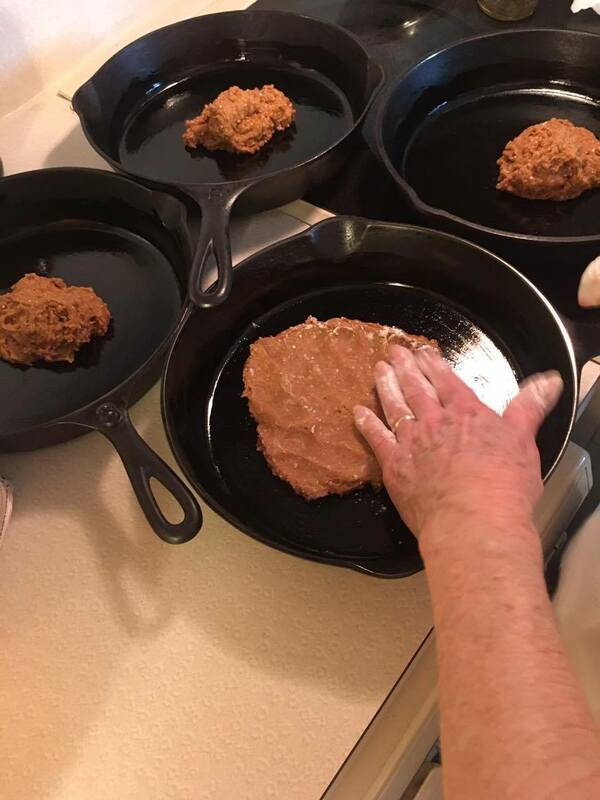 Mom patting out her dough in iron skillets, the traditional way to bake a stack cake! Mom pouring her heart and soul into the groom's cake! 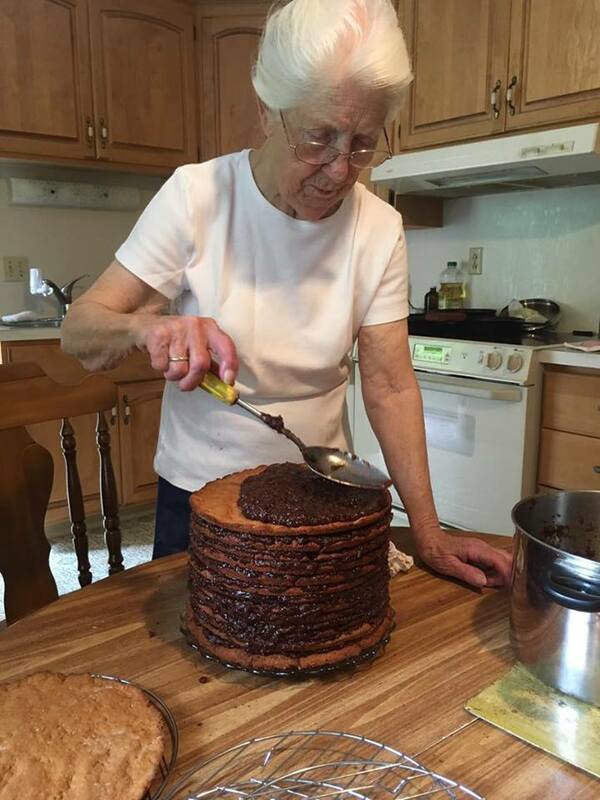 Mom with the finished 14 layer apple stack cake! 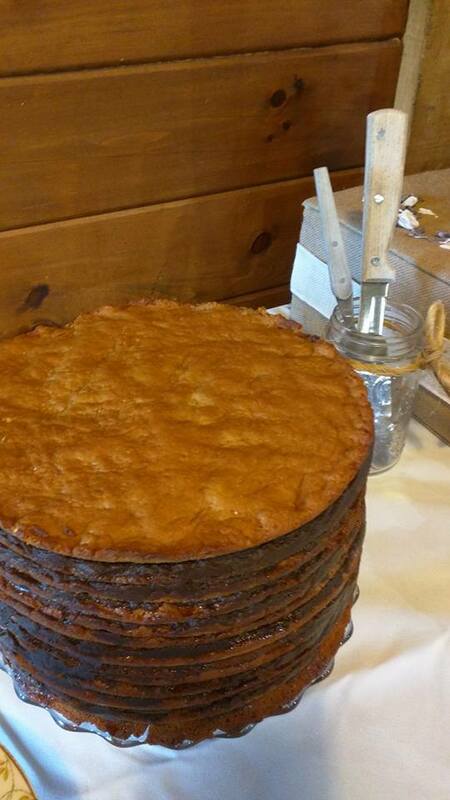 This groom's cake inspired me to share a similar traditional recipe from Appalachia with you today. My mother doesn't cook from a recipe, but she has talked me through how to make this enough that I am able to pass it along to you in recipe form. 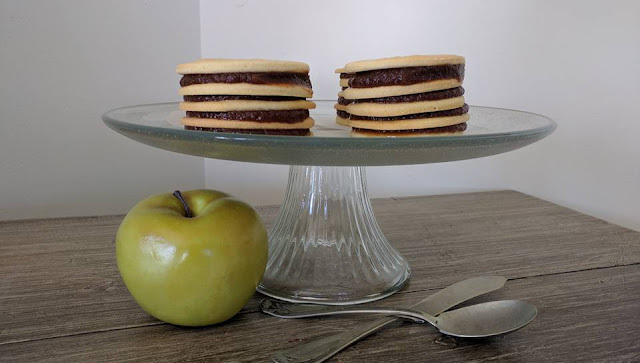 The beauty of this recipe is that you can actually make two different desserts all at once--Old Timey Appalachian Tea Cakes AND Mini Kentucky Apple Stack Cakes! 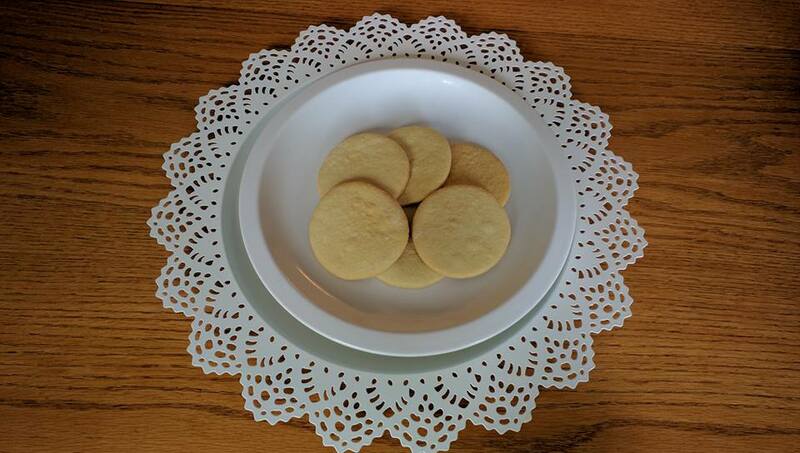 Tea cakes were a very popular cookie in Appalachia years ago. 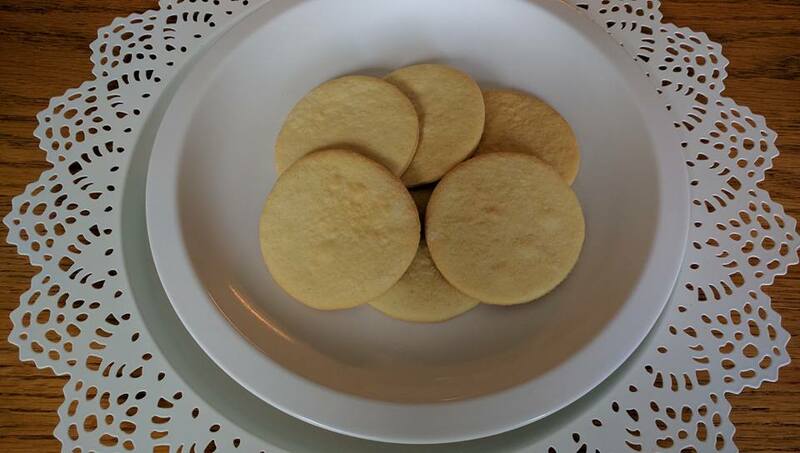 They were a lightly sweetened, relatively low in fat cookie that could be made in large amounts...and kept very well. This was a perfect fit for large mountain families where the cooking needed to feed several mouths for several days. 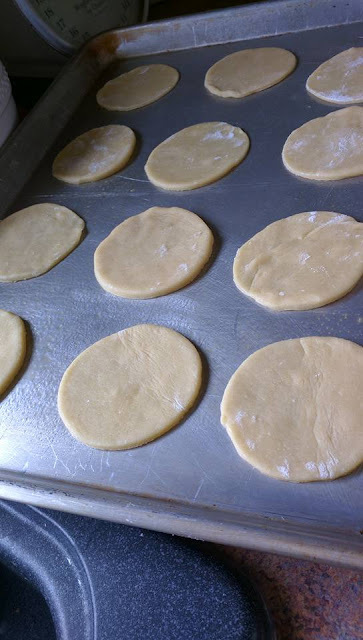 My Eastern Kentucky mamaw would actually mix up her tea cakes in a big old dish pan, and then, when finished, store them in a very large cooker...that's how many she would make in one batch! The truly nifty thing about tea cakes and apple stack cakes (at least by my family's tradition) is that the dough used to make each is essentially the same. This was so true that when my mamaw made apple stack cake, if there was any dough left over, she would roll it out and cut out a few tea cakes to bake from what remained. And then here is where the fun truly happened! 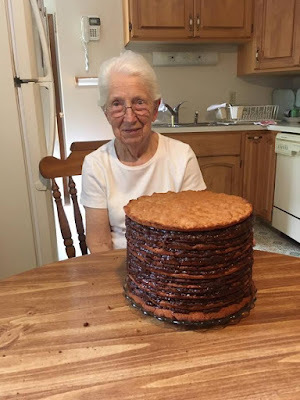 If there was any apple filling left over after forming the apple stack cakes...she would often take the little tea cakes she had made from the dough scraps and combine them with the apples to make little bitty apple stack cakes for the children in the family! How precious is that!?! There was no wasting anything around my mamaw! I wanted to duplicate these individually portioned desserts like my mamaw used to make, and the results were fantastic! So here we go...this is how you make Old Timey Appalachian Tea Cakes and Mini Kentucky Apple Stack Cakes all at once (of course you can also just use this recipe to make one or the other...don't let me hold you back now!). 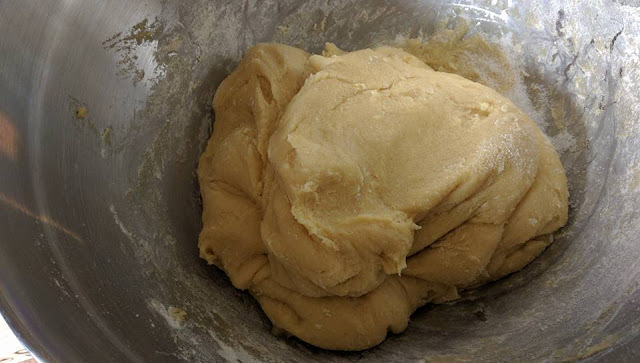 I made a VERY large batch of tea cakes (Mamaw would be proud)...but at the bottom of the post I will also share the written recipe for half this amount if you aren't looking to make this for a big crowd. 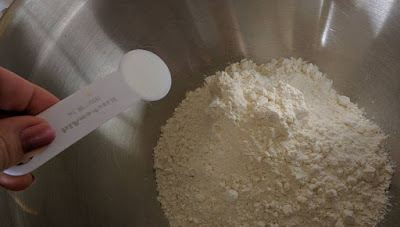 For the tea cake portion of the recipe you will need flour, baking soda, salt, sugar, butter, eggs, vanilla, and buttermilk. 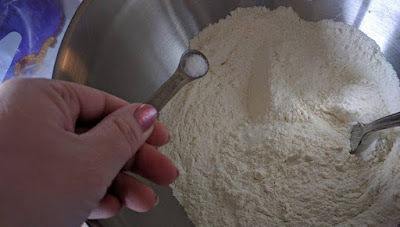 In a large mixing bowl, combine flour, baking soda, salt and sugar. 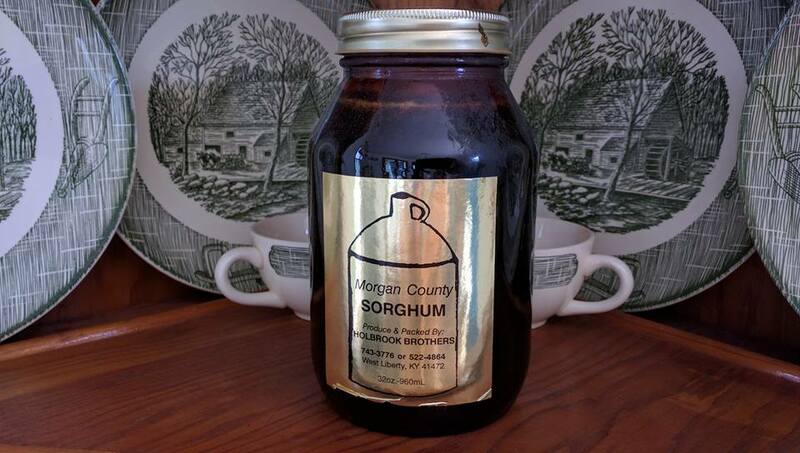 Traditionally, a lot of women in Appalachia used sorghum to sweeten their tea cakes and apple stack cake dough. But mom also informed me that if the women were lucky enough to have some sugar on hand, they would commonly use that as well. So I happened to sweeten my recipe with sugar, but you may substitute with sorghum for an even more traditional flavor if you like. 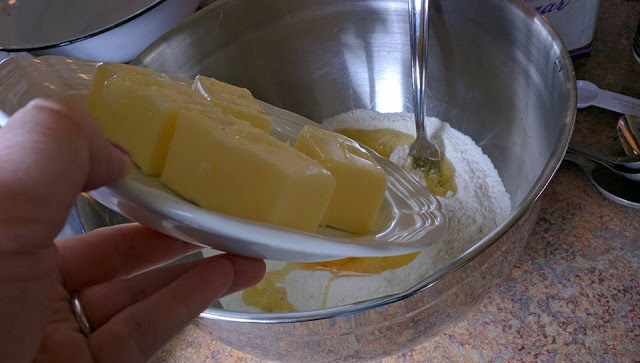 Then add softened butter, eggs, vanilla extract, and enough buttermilk to get a dough that you can roll out with a rolling pin (think close to pie crust consistency). 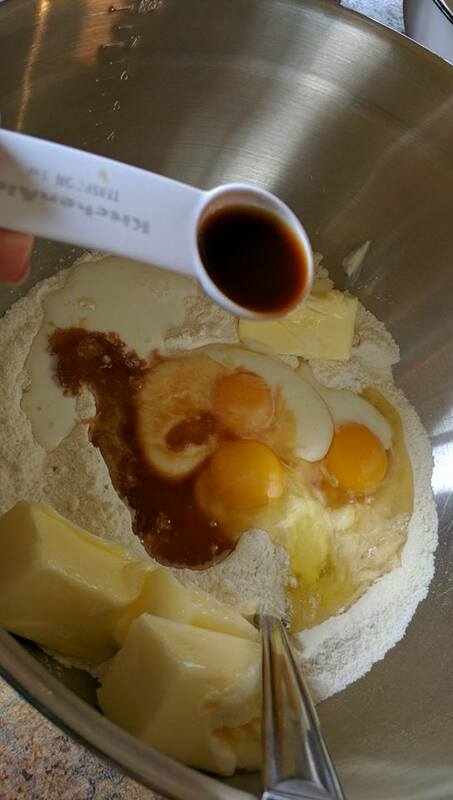 Stir all the ingredients together until a workable dough forms. 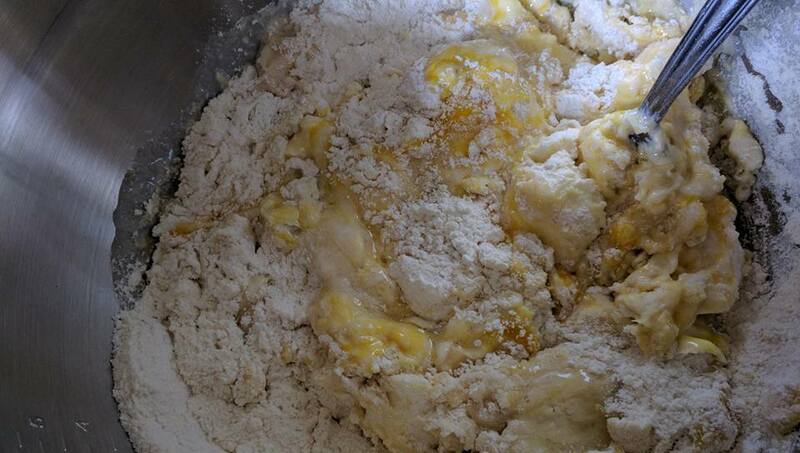 Now my mamaw used her hands to work her tea cake dough together...so you feel free to do the same if you like. I won't tell! If your dough seems too soft, knead in a little extra flour right before you roll the dough out. This recipe is very forgiving...and my mother assured me that in reality there were variances each time the women in Eastern Kentucky made these tea cakes as well (especially since most did not use a written recipe). Roll one-third to one-half of the dough out at a time on a WELL floured surface. 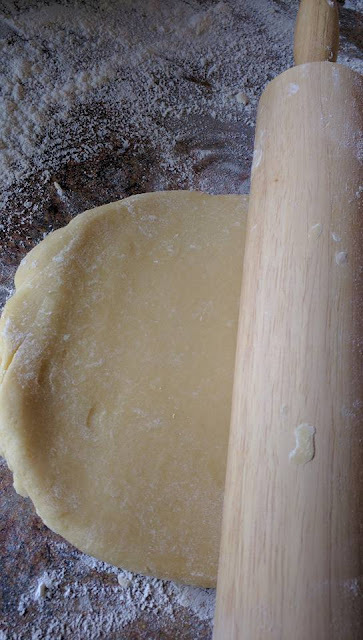 Roll the dough as thin as you can without breaking the dough apart. 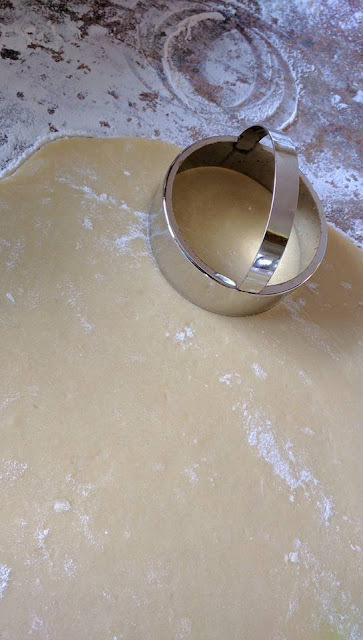 The thinner your dough, the crispier and more flavorful your tea cakes will be in the end. 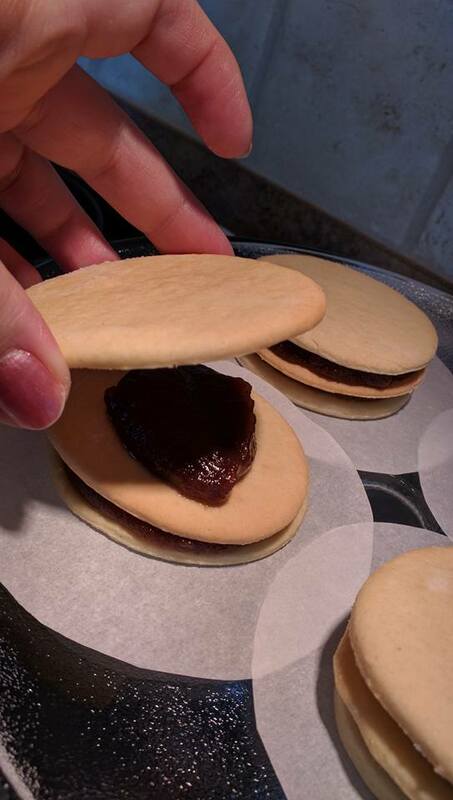 Using a three inch round cookie cutter or biscuit cutter, cut out the tea cakes and place on a greased (or sprayed) cookie sheet. 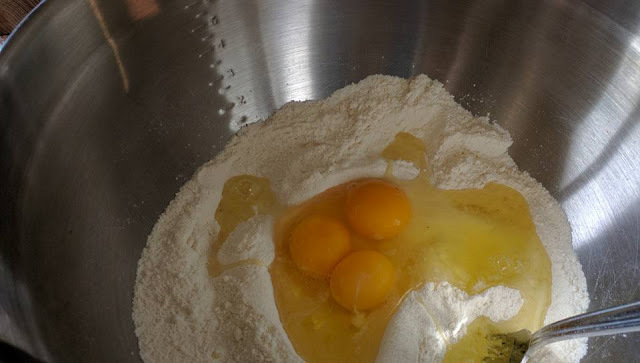 They don't spread much while baking, so a few centimeters apart should do the trick. Bake at 350 degrees for about 10 minutes, or until lightly browned around the edges. 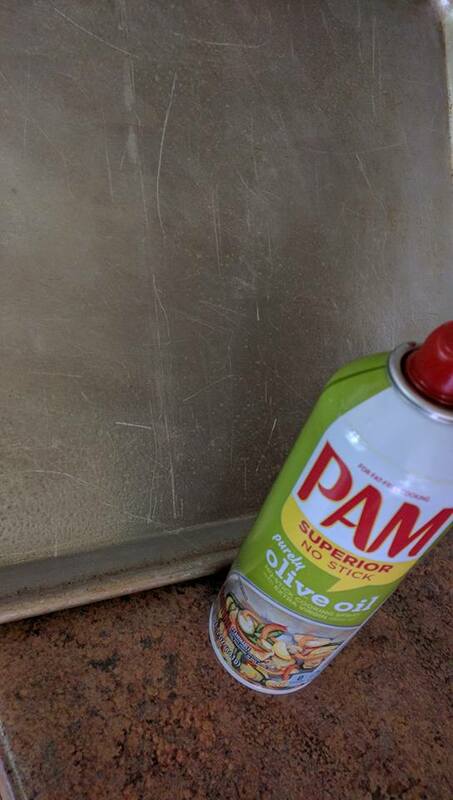 Remove from pans and allow to cool completely on cooling racks. 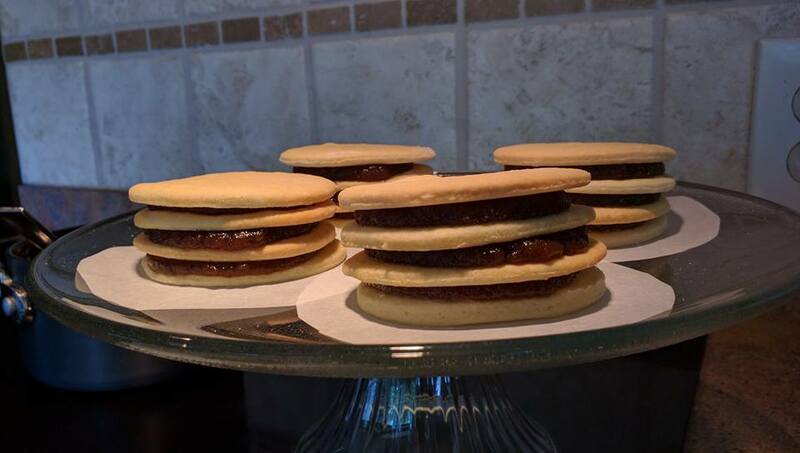 If you would like to also make these tea cakes into Mini Kentucky Apple Stack Cakes, you can use all of your tea cakes to make a large number of stack cakes, or you can use just some to make whatever number of stack cakes you want. I ended up just making 5 Mini Kentucky Apple Stack Cakes, and leaving the rest of the tea cakes to snack on. 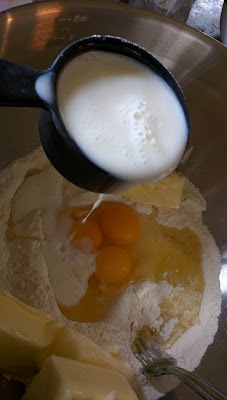 I love the versatility of this recipe! I went the simple route with this and used store bought apple butter for my apple filling. 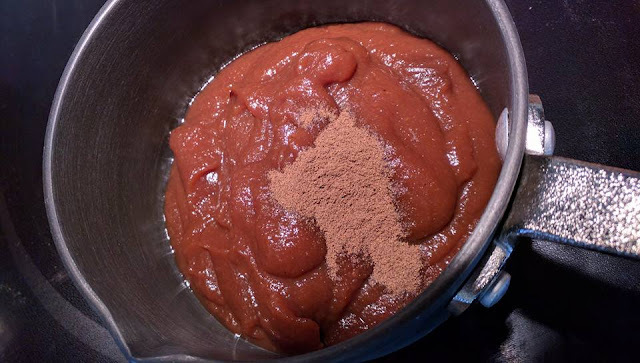 Traditionally, women in Appalachia made a sauce-like filling for stack cakes with dried apples. 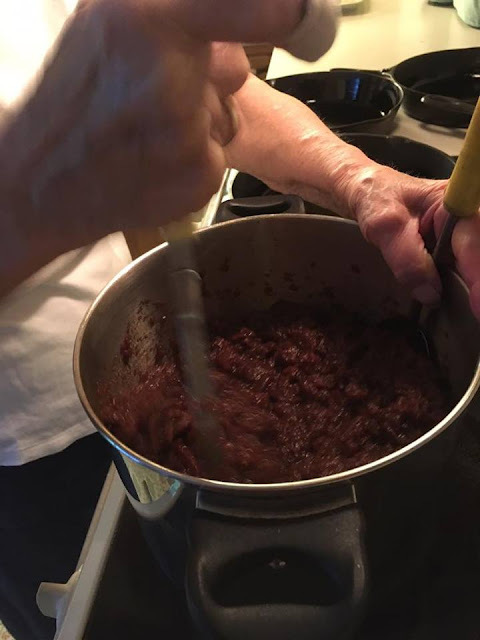 They would cover dried apples with water on the stove, cook them down (mashing as needed to make a saucy consistency), spice the apples heavily with cinnamon and allspice, and sweeten with either honey or sugar. When my mom made the groom's cake for my nephew's wedding, she did it from scratch with dried apples that had been grown in Kentucky. When my mother cooks you can bet every bit of it is from scratch and traditional all the way! Mom mashing her dried apples for her 14 layer Kentucky apple stack cake! But mom did give the nod of approval for me making mine with apple butter, as it has a similar consistency and flavor...and in more recent years a lot of Appalachian women have used apple butter on their stack cakes. So feel free to use whichever method suits your fancy...dried apples or apple butter. 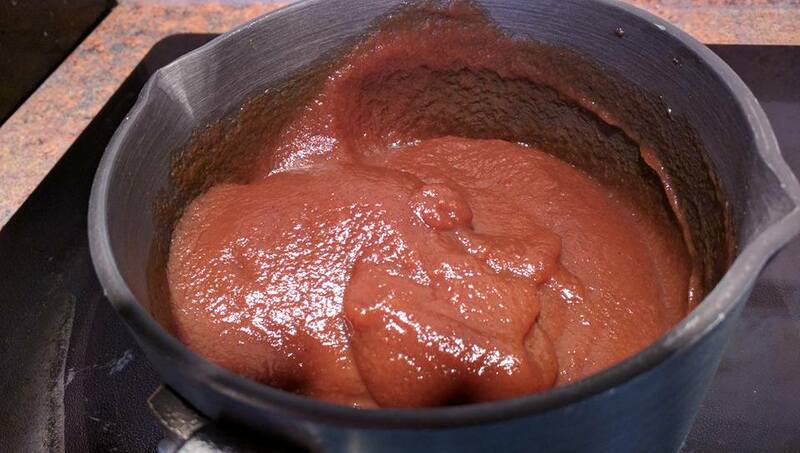 If you use the apple butter like I did, you need to heat your apple butter on the stove prior to use. 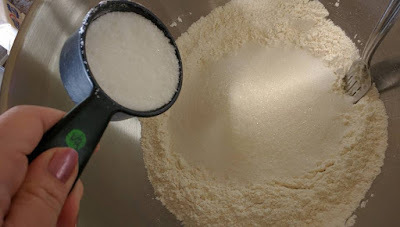 This will help the apples to soak into your cookie layers better, creating a cake that is more moist. 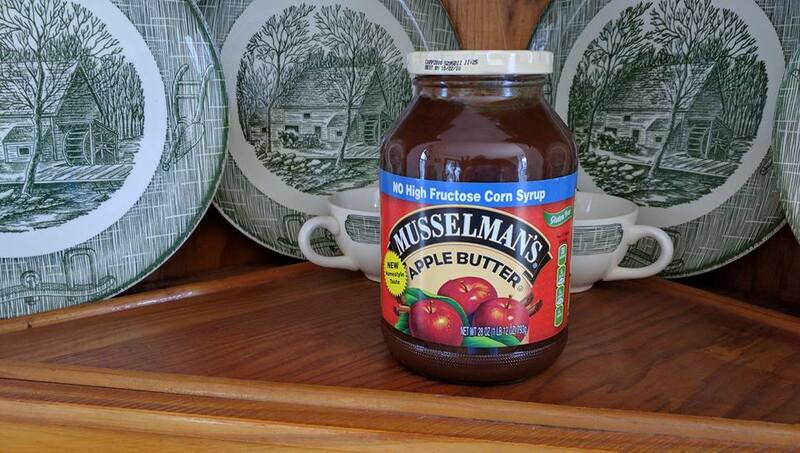 I chose Musselman's apple butter because the ingredients were simple and closer to homemade...apples, sugar, cloves and cinnamon. 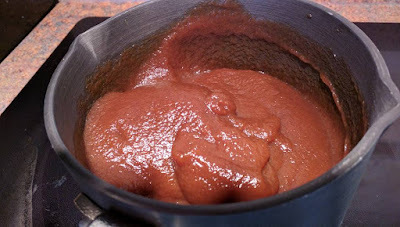 But I wanted to get a little more spiced flavor, so as I heated it, I added some allspice into the apple butter as well. Once the apple butter is heated through, you can begin assembling the Mini Kentucky Apple Stack Cakes. It is best to assemble them on a plate or dish that can be covered...as these cannot be served right away. They need to "set up" in the fridge for a few days so they can soften. Years ago, apple stack cakes would not have been refrigerated, so they had to be covered and left at room temperature for a couple of days. Luckily, now we have refrigeration that allows for longer set up time, and a much less dry apple stack cake! 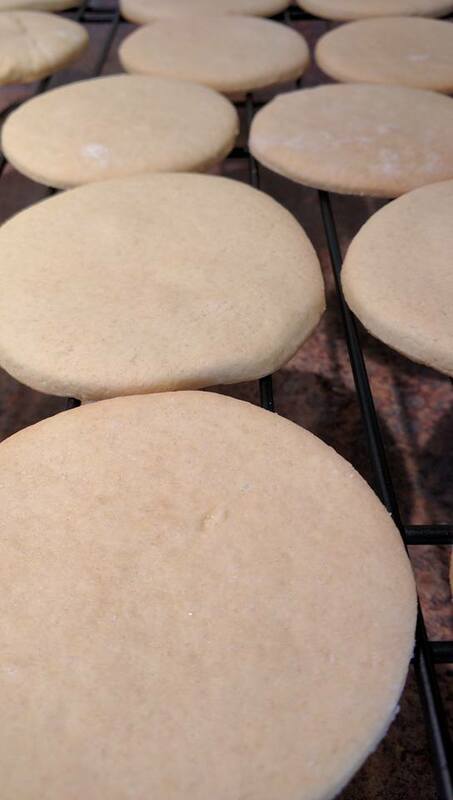 I assembled my stack cakes on rounds of parchment paper, but that is certainly optional. 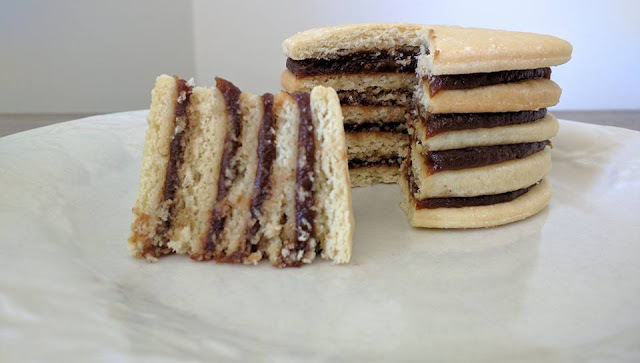 Just alternate layers of tea cake cookies and spoonfuls of apple butter as you build your mini cakes. I built my Mini Kentucky Apple Stack Cakes with 5 layers, but 4 layers would work well too. Any higher and it becomes a struggle to keep aligned. Once assembled, cover the stack cakes and refrigerate for 3-4 days before serving. So if you made your apple stack cakes on a Friday, you could serve them on Tuesday or Wednesday. For freshness, you don't want to wait longer than that...but I can't stress enough the importance of having a decent set up time in order to have a good apple stack cake. Don't rush it....the wait is essential, or you will be sorely disappointed with the end result. 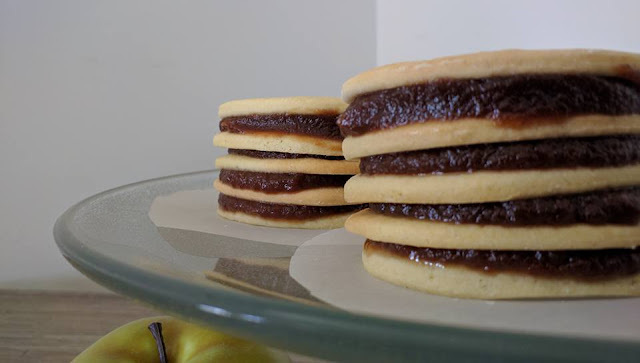 Great thing about this recipe is you can enjoy the Old Timey Appalachian Tea Cakes the day you make them, and then enjoy the Mini Kentucky Apple Stack Cakes a few days later. Perfect for those of us with little patience! 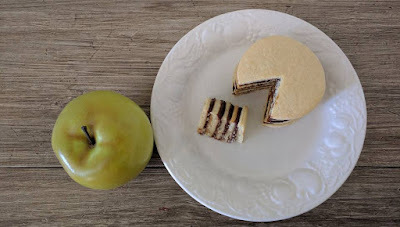 These Old Timey Appalachian Tea Cakes and Mini Kentucky Apple Stack Cakes were so good! The tea cakes are a great accompaniment to coffee, tea, or ice cream (course I like to eat them as a snack by themselves). 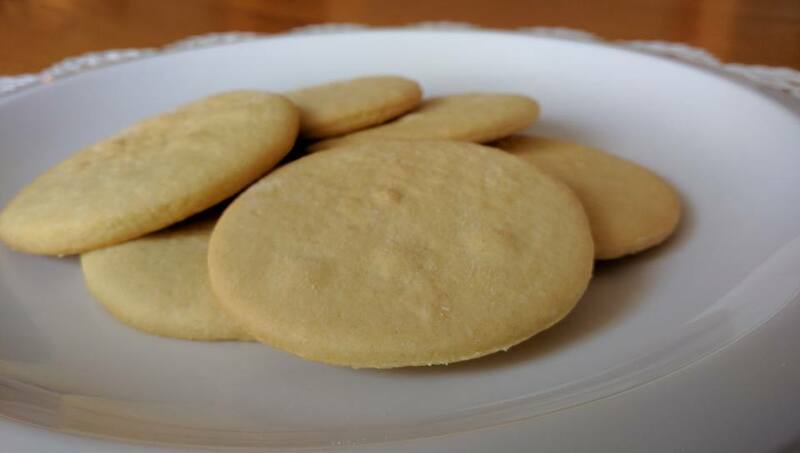 They are ever so lightly sweet, with just a hint of mild buttery crispness. You can eat a ton before you realize what you're doing....not that I'm speaking from experience or anything! And the stack cakes are deliciously moist, spiced, and....oh my word, SO CUTE! They are reminiscent of a cupcake in that they are individually portioned, and did I mention they are CUTE? Mamaw may have made them for kids, but I don't know of any adult who would complain about being served one of these adorable little mountain style treats! 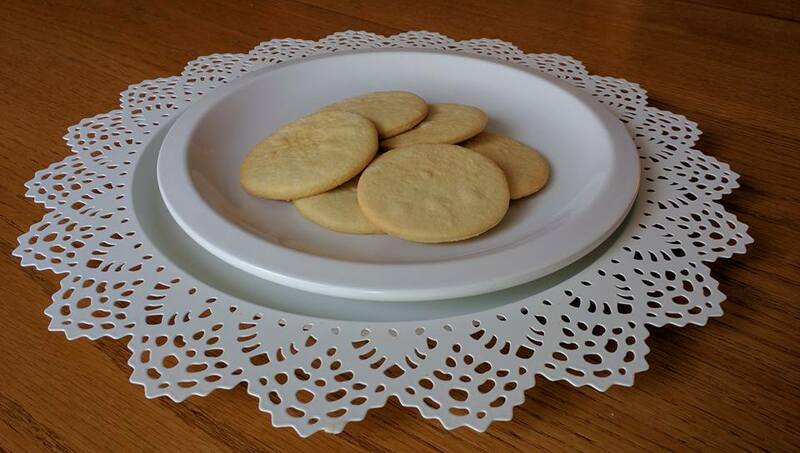 Wouldn't they be wonderful desserts to serve at a wedding or even a bridal shower? Apple stack cake is certainly a great way to celebrate anything...and these mini versions make it really easy to do so! If I were you, I'd go make some today to honor your mountain roots...because, after all, those roots are worth celebrating! The full recipe is shown below. 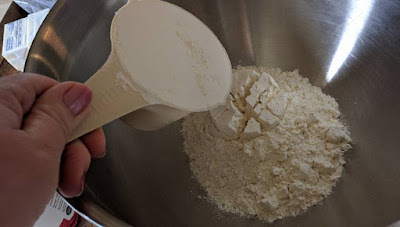 You can click here for a printable version of the full recipe, or you can click here for a printable version of the recipe halved. Until next post, blessings to you and yours! 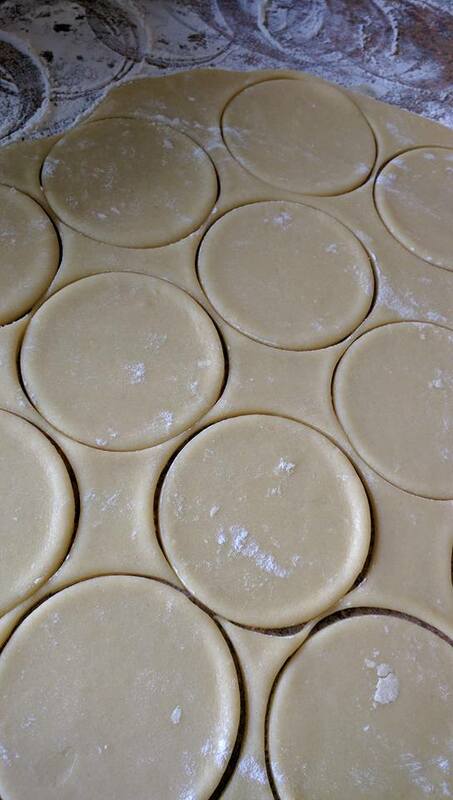 For tea cakes, preheat oven to 350 degrees. In a large mixing bowl, combine flour, baking soda, salt, and sugar. Then work in butter, eggs, vanilla and just enough buttermilk to create a rollable dough. 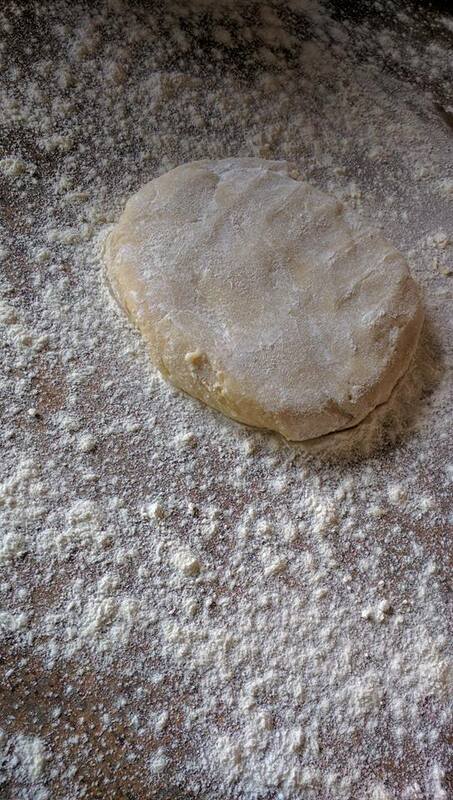 Once well combined, divide dough into thirds or half to roll out one part at a time on a VERY well floured surface. Roll to a quarter inch thickness or less and cut out with a three inch cookie or biscuit cutter. 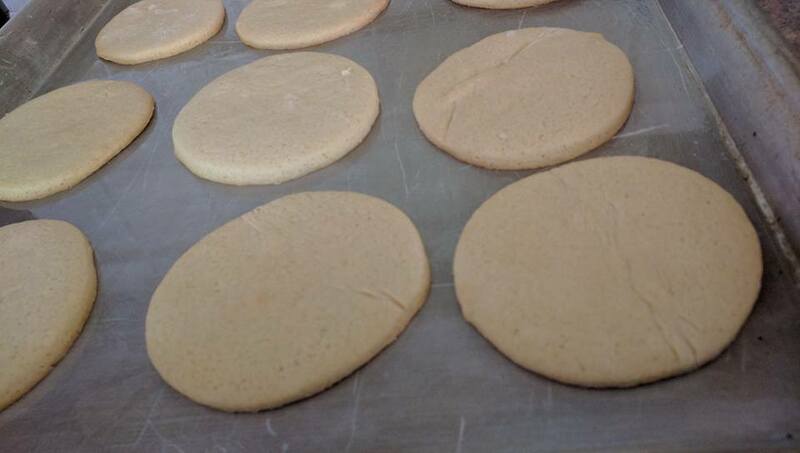 Place on a greased baking sheet and bake for 10 minutes or until edges are light golden brown. 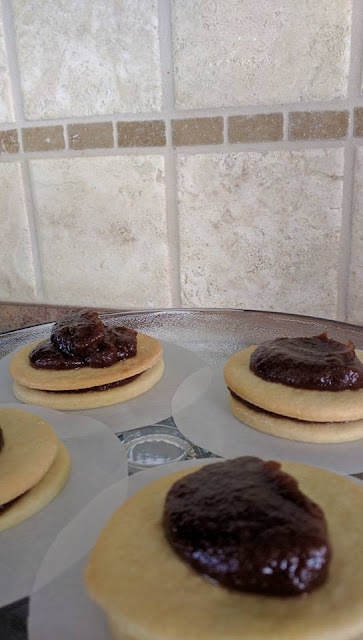 Remove tea cakes to cooling racks immediately. 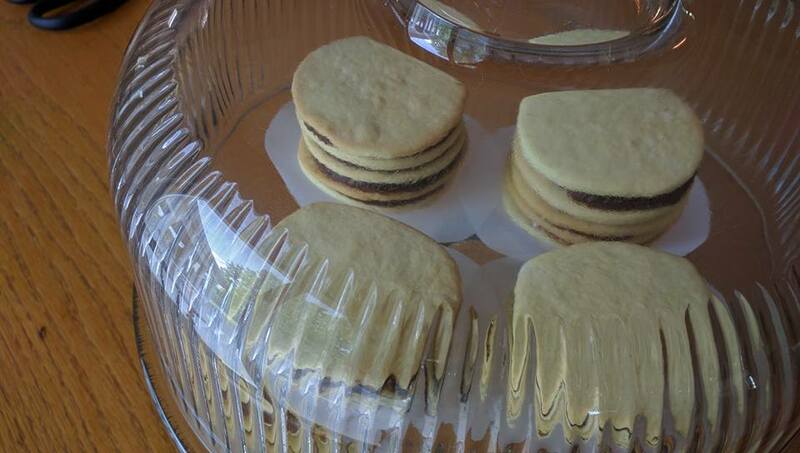 Cover mini stack cakes and refrigerate for 3-4 days before serving. Love apple stack cakes. 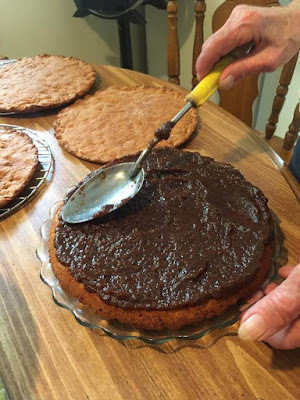 While growing up my mother made them using ginger and other spices in the cake and spreading her homemade apple butter between the layers. It was delicious. The cake didn't stay around long because there were 7 in our family. I will be going to see her in Ohio soon and I'm going to request she make one. She didn't use a recipe either just like all of her wonderful cooking. I bet that homemade apple butter made her cakes amazing, Tricia! Thanks for sharing! My Mamaw used to make one every Christmas! Always was my favorite with her delicious homemade apple butter. I bet it was delicious, Carolyn! My grandmother made her cake with a lot of ginger, a great many eggs, and a heavy molasses. When she baked the layers in an iron skillet(in a wood burning cook-stove) they came out dusty with flour and quite dry. 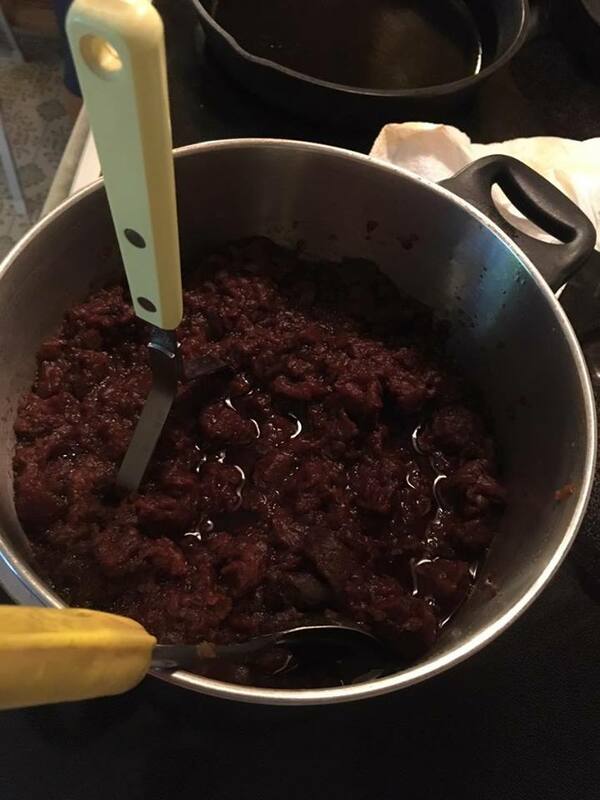 Her topping of choice was made with dried reconstituted apples that stewed for hours. What a heavenly smell and taste with coffee, late at night!